Hello everybody! I am back again with a simple yet very delicious rice dish. This recipe shows you the best way to deal with left over rice. 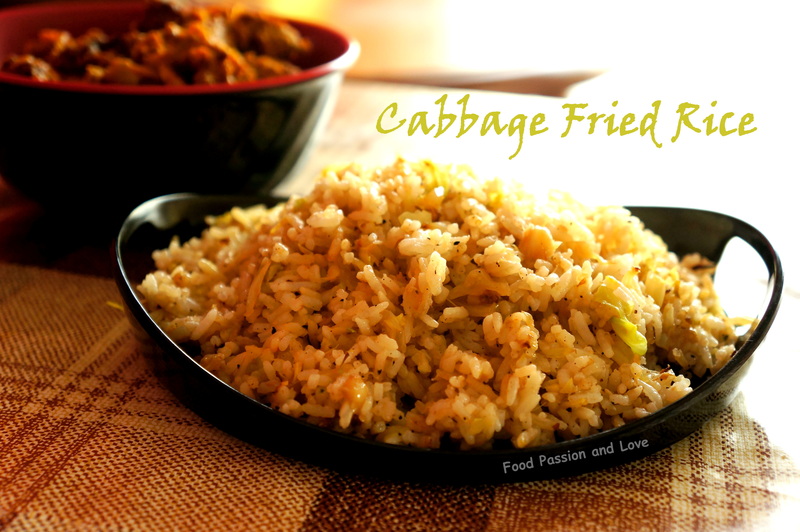 Actually, I have never used it with left over Rice.I have cooked rice specifically to make this cabbage fried rice. Because my family just love this dish.And I have made it like a zillion times. This is one best way you can sneak cabbage into your little one’s diet though this dish. And you can prepare it in a jiffy, there is no advanced preparations..nothing! This Rice has some great asian flavours. It is so flavourful. Seriously you wont realise that you are eating cabbage! I always rack my brains thinking of ideas to add variety to the menu of my family. Like yesterday it would have been totally traditional…like Rice with Pineapple Pulisseri and Kerala Naadan Fish Fry ; Today it will be this very flavourful Indo Chinese Cabbage Fried rice with Gobi Manchurian or Chilli Beef .After all we all love changes in life don’t we?This Cabbage Rice will surely bring that change to your menu!And it is an ultimate comfort dish. Cooked Basmati Rice – 2 cups. Freshly ground Black Pepper– 1 heaped tsp. Heat oil in a pan and add the crushed ginger and Garlic and sauté for 1 minute.Now add the chopped Onion and sauté well till light brown. Add the freshly ground black pepper to this and sauté well.Now add the Finely sliced cabbage and salt and sauté well and keep the pan covered on low flame until the cabbage is cooked(for about 4 minutes). Once you find that the cabbage is cooked, add soy sauce and sesame oil and turn the flame to medium. Add the cooked Rice and gently combine well. Add salt if needed. Turn off the flame. Transfer to a serving plate and serve ! This entry was posted in Uncategorized and tagged Asian recipes, cabbage recipes, indian, Indo chinese, rice recipes, Sesame oil, Soy sauce, vegetarian. A few months back , my dear friend Smitha had asked me if I knew any oats recipes.To tell you the truth,I didn’t frankly know any because I had never cooked oats at home.To be frank..like my kids I am was a very fussy eater too. I recall my mom telling me the tough times she had making me eat! !In the latter years, when I grew up in my grand parent’s home,I clearly remember the times I truly enjoyed giving a tough time for my grandparents, making them run behind me with a plate of food in their hands..I was the only grand child at that time in my maternal and paternal houses and that too a naughty one! !But then while studying in college,I had to stay in our college hostel,where the food was intolerable.Thats when during my holidays when I went home I started eating almost everything that didn’t bite back!! Now when I run behind my kids with the plate in my hands in my desperate attempts to feed them,my mom laughs at me..saying Enjoy ha ha!! So to cope with this problem of fussy eaters in the family,I have come up with a few tricks up my sleeve.So this is how this recipe took birth.When I started to make it ,I wasn’t sure how it would turn out.But I am happy! !It was a success..!So Smitha,I keep my word.Here goes the recipe.I am sure all kids will love it!! Cocoa powder – 2 ½ tbsp. Melted Butter – 3 tbsp. Heat a pan and fry the oats for about 2 to 3 minutes on a low flame or till the raw aroma disappears.Allow to cool.Then grind in a mixer to a fine powder and transfer it to a bowl. Now to this bowl of powdered oats,add cocoa powder,Melted Butter,Honey.mix well with a spoon. Apply butter to your palms and gently roll the above mixture into small balls.Decorate with sprinkles or chocolate grains(Your Choice) and serve and Enjoy!! Frying the oats is entirely optional.I fried because I don’t like the taste of raw oats. This entry was posted in Uncategorized and tagged chocolate, easy snacks, honey, kids recipes, no bake, oats. An Onam Sadya is unimaginable without Parippu curry.Choru,parippu curry ,Pappadam and Neyu(Melted Ghee)..Have you tried that combination?Its awesome!If you haven’t..You seriously must!The recipe is actually too simple..You might think then why I am sharing this recipe..! Well there might be a lot of beginners out there like how how I was a few years back…God..cant imagine those times when I didn’t even know the basics of cooking..!All I knew was how to make a tea and an omelette..I got more involved into cooking after I became a mother to a toddler..Funny isn’t it…Thats how life is. Lets come to the recipe..This parippu curry is usually prepared at my home using Tur dal..but my Mom in law prepares it with green gram dal(Moong dal)..I find that more tasty and authentic ..Ofcourse recipes differ with different regions..For example take the example of the simple Fish curry..At my home its prepared as the typical Kottayam style fiery Kudampuli ittu vecha Red Fish curry…Oh I love that soo much..Amma even prepares makes Fish pappas,where Fish is marinated and fried and then cooked in a coconut milk gravy..So mouthwatering !Back in my husbands home,its the Tenga aracha nadan Fish curry,Trivandrum style..My mom in law even prepares it in the form of Varutharacha Fish curry,my hubby’s very favourite.Now if you travel further to Trissur ,I heard from one of my friends from Trissur that fish is cooked in coconut milk with Kudampuli…the typical Trissur style Fish curry..I have tried that too..You will find the recipe soon in my Blog. Oh God…I always have tendency to stray away from the subject..I start with something and end up with something totally different..Okay…not any more.Lets come to the recipe of the authentic Kerala Sadya parippu curry. Cook moong dal along with turmeric powder, salt and water until soft and mushy and keep aside. Grind grated coconut along with cumin seeds and garlic and a little water to a smooth paste. Add this mixture to the mashed dal and mix well.Heat this on a low flame. In another pan simultaneously heat oil, add mustard. When it crackles, add Red chillies, Curry leaves and the shallots and sauté till shallots are light brown and golden. Turn off the flame and add this to the Dal and mix. Add a little water if too thick. Add salt if needed. Turn off the flame and Serve hot with Rice, Pappadam and Ghee and Enjoy!! 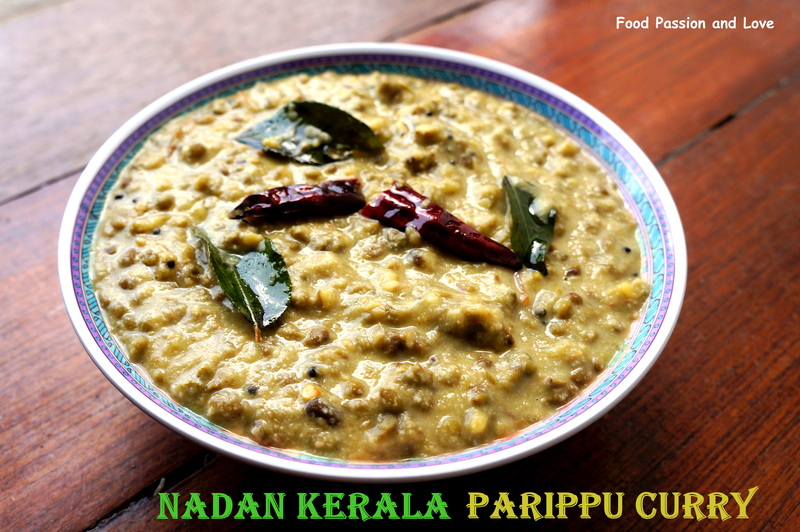 This entry was posted in Uncategorized and tagged Cherupayaru curry, Green gram dal, Kerala dishes, Nadan parippu curry, Parippu, Sadya recipes, Vegan. MOTICHOOR LADOOS for a special day!!! Hello every body…Today is a very happy day for me…My Blog “Food Passion and Love” which reflects my penchant for good food and my passion for cooking and my love for my family is turning 1 year old! I cannot express my happiness…I never knew I would travel this much far..Food Passion and Love has given me a lot of happiness in my life.I have made some good friends from different parts of the world..Though I don’t get much time for blogging with my kids running around me and household chores..you can imagine..! Many a times I have felt like quitting..like putting a total fullstop to blogging because of the stresses in day to day life.Now I thank God I didn’t…Now when I sit in front of the Laptop looking at my Blog..I feel tears welling up in my eyes..it truly gives me a feeling of a sense of achievement. The real Blogiversary of Food Passion and Love was on April 2nd ..but due some reasons I could not post or celebrate it here with you all.But what say?Better late than never! 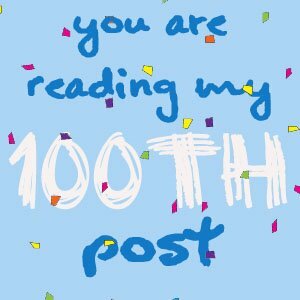 Today is all the more sweeter because today I am posting my 100th post..!Seriously..OMG!Did I cook 100 dishes? Ha Ha Ha..So today I am sharing these sweet news,since its a 2 in one celebration for me! Today my post is Motichoor Ladoos.My very very very favourite. I first had Motichoor Ladoos in Sri Krishna sweets Chennai..I tried one..God..I loved them..I think I could eat 100s of them..really I am not exaggerating! They are extremely irresistible.Infact after eating those ladoos that day ,it had been one of my secret ambitions to make Motichoor Ladoos..though I never mentioned it to any body.I had heard it was a back breaking process to make these ladoos from many of my friends..So I didn’t have the courage to try them until today.. I was totally tensed when I was making these ladoos(Thanks to stories by my dear friends)..but I was overjoyed to see that they turned out to be perfect..I am so happy.Do try it out! Boiling Water – 1 or 2 tbsp. Water – 1/2 cup or as needed. Now take sugar and water in a pan. Mix well so that the sugar gets dissolved in the water. Bring this to a boil. Simmer for 8 to 10 minutess till it forms one string consistency. If you dip the ladle inside the sugar syrup and take it out, then the last drop falling off the ladle should form a string like effect. Now add in cardamom powder and saffron to this and mix well. Now make sure the syrup stays nice and warm till you finish frying the boondis. Heat oil for deep frying. Dont get it too hot. Now take a boondi ladle / perforated spoon ( I used a steel strainer with medium size holes in it). Now take the batter and pour it over the ladle. Using a spoon tap off the ladle, so the boondi will fall through the holes. Fry this on a medium high heat for couple of mins. (Remember each time you are going to fry the batches,wipe clean the laddle with a tissue paper).It shouldn’t get crispy, it should be little on the softer side. Drain the boondi onto a bowl and set aside. Repeat till you finish the batter. Now add all the nuts to the boondi and pour the warm syrup over it. Mix well so it gets combined. Now take this in a mixer or food processor. Add a tbsp of boiling water to this and pulse for few times so it gets crushed and becomes one mass. Dont grind it too much or it will get completely mashed up. Now transfer this to a bowl. Dip your hands in ghee and take a small portion from it. 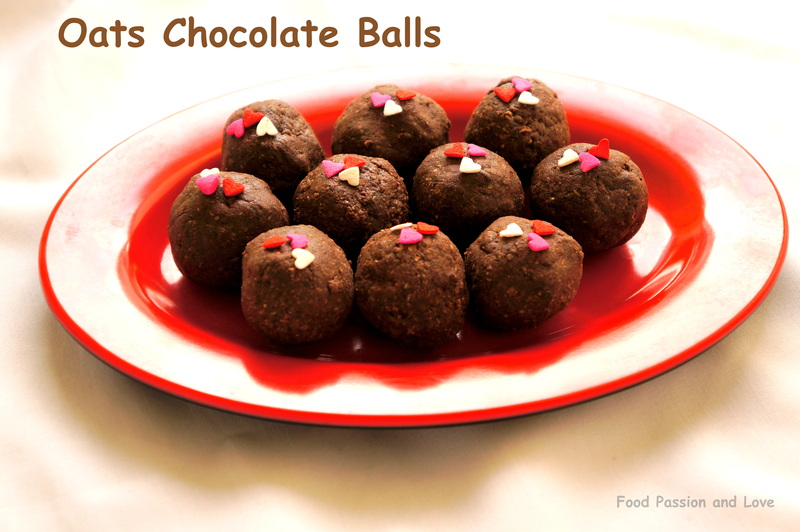 Shape into balls and arrange them on a plate. Decorate with a slice of almonds and enjoy! 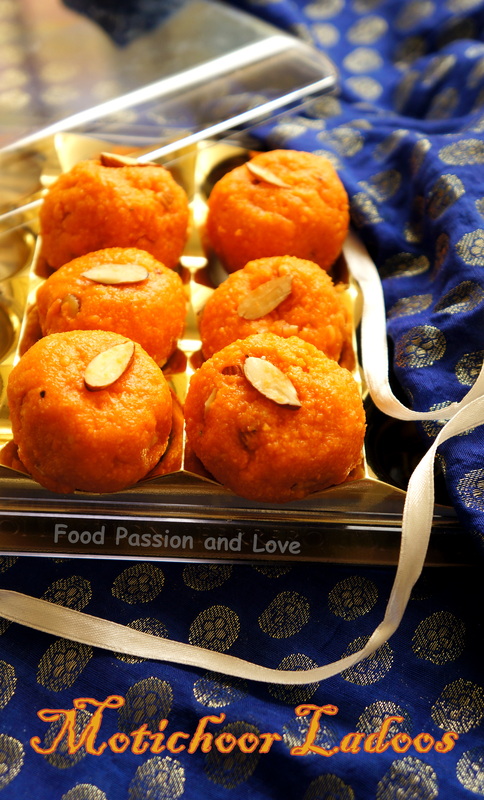 This entry was posted in Uncategorized and tagged boondi laddoos, Diwali, Festival, Ghee, laddus, Motichoor ladoos, North Indian sweets, Rich sweets, sweet, traditional Indian sweets. 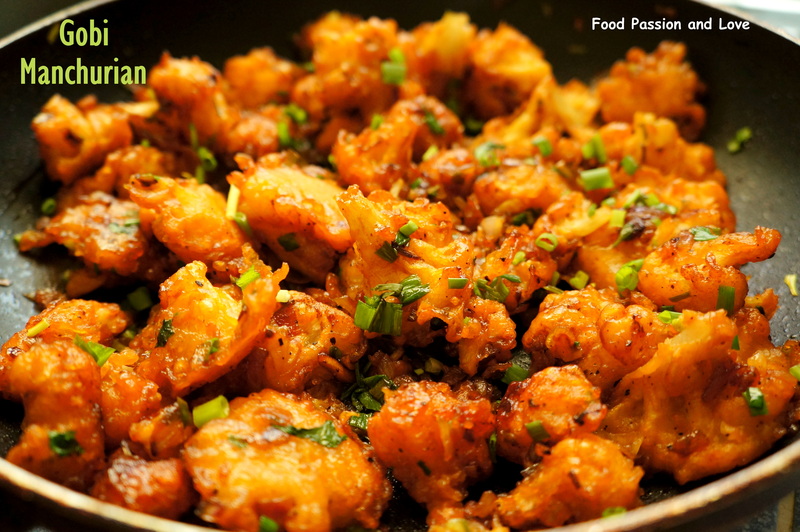 Today I wish to share with you the recipe of a very popular Indo- Chinese dish , Gobi Manchurian or simply Cauliflower Manchurian. Cauliflower is not a favourite vegetable of many , but Gobi Manchurian surely will change your attitude towards this vegetable like it did to me 🙂 .Its so tasty. Crispy on the outside yet juicy in the inside. Gobi 65 is another such dish that can surely make you love cauliflower.Its so easy to make.When ever we have any function at our house,I make it a point to make Gobi Manchurian.Here goes the recipe. Cauliflower – 1 medium sized. Maida(All purpose Flour) – 2 tbsp. Baking Soda – 1 pinch. Cut the Cauliflower(Gobi) into tiny florets.Wash it thoroughly and keep aside in a bowl. In a sauce pan,boil some water.Turn off the flame and pour this hot water onto the cauliflower florets allow to sit for 1 minute and drain the water away. Now in a bowl,mix Maida(all purpose flour),corn flour and baking soda and a touch of salt together.Add a little water and make into a smooth and uniform batter without any lumps,consistency thick enough to coat the florets. Heat oil to deep fry the florets in a pan.Now dip the florets into the batter and deep fry till crisp.Drain the excess oil on a kitchen towel and keep aside.Once you have finished deep frying all the florets,turn off the flame. Now heat 3tbsp of oil in a pan.Add chopped Garlic and give it a quick stir.Then add the white of the spring onions.Saute.Now add the cubed Onions and sauté till transparent and soft. Now add the pepper powder and stir.To this add the sauces and salt and mix well . Add the deep fried Cauliflower florets toss to mix uniformly.Lastly,add the green of the spring onion and mix gently and serve with Noodles or Chinese style Rice and Enjoy! You can also add some cubed capsicum for extra flavour. This entry was posted in Uncategorized and tagged Cauliflower, Chinese side dish, Easy, Fried Rice side dish, Gobi, Indo chinese, Manchurian, vegetarian. Today I loved the climate outdoors..Sunshine and Rain…both together..hand in hand..in harmony.It reminds me of myself and my husband..He loves rain.Me on the other hand love sunshine.So today is a perfect day for both of us and it happened to be the weekend.So I decided to make it extra special by making Chicken Cutlets this evening.This is super easy and a regular in our family.Check it out! Pressure cook chicken with chilli powder,coriander powder,turmeric powder,crushed pepper and garam masala for 3 whistles and when the pressure releases,open the lid and heat till all the stock/gravy evaporates.Allow to cool. Mince this cooled cooked chicken in a food processor/mincer/grinder and keep aside. In a pan,heat 1 tbsp of oil,and add ginger garlic paste and onions and chopped curry leaves ,chopped coriander leaves,chopped mint leaves and green chillies and saute well. Now add the minced chicken and combine well.Then add the mashed potato and mix everything well .Add salt if needed and turn off the flame and allow to cool. 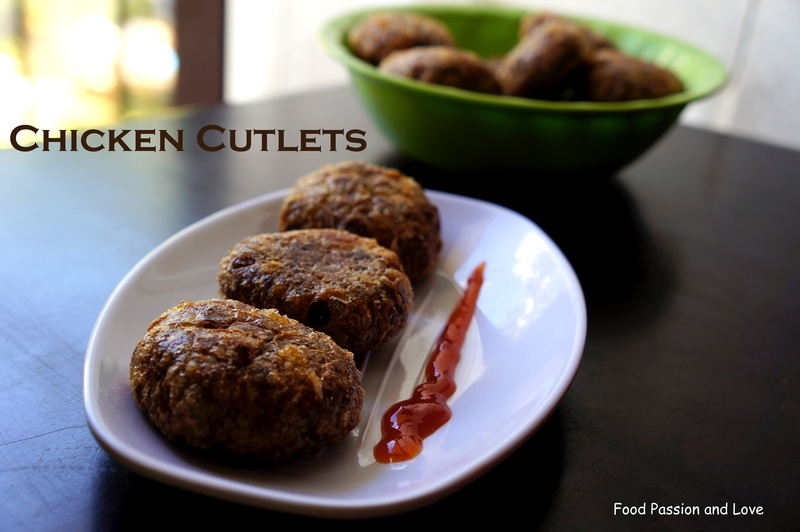 Make the above mixture after cooled into small balls and using your palm,shape into cutlets. Dip the cutlets in egg batter and then roll in the breadcrumbs and deep fry. Serve hot with tomato sauce/mayonnaise and Enjoy!! The shaped cutlets can be stored in the freezer for a month. Bring it to room temp before frying. This entry was posted in Uncategorized and tagged Chicken dish, Chicken starter, Evening snacks, Indian starters, Kids snacks, Non vegetarian, snacks. Pudding is everyone’s favourite dessert..young and old alike..Who wouldn’t like a creamy,chilled pudding after a long day at the office..all curled up in the couch,watching your favourite TV show!! 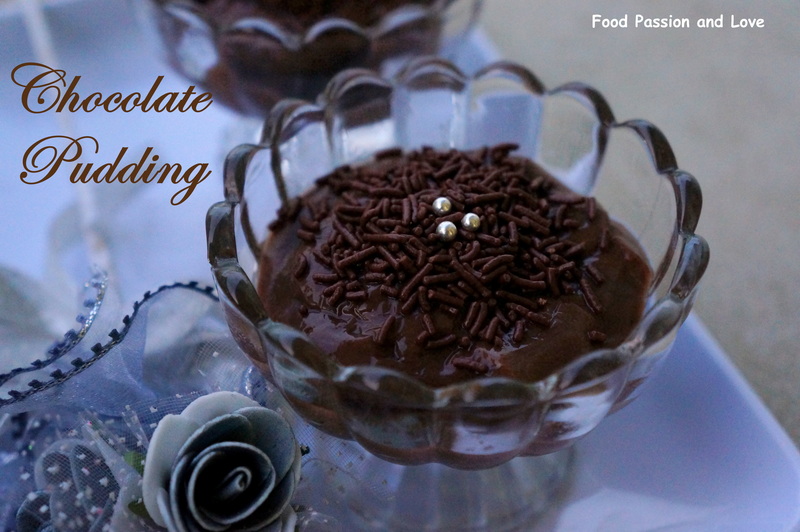 I would love it…and I am sure you would too..Today my post is a Super Chocolatey Chocolate Pudding.This is perfect for all of you chocolate lovers out there.And if you have kids like mine whos is crazy about anything chocolatey,then this one is a winner.I tell you they will adore you for this!!! Milk – 1 ½ cups. Salt – a small pinch. Choco chips – 3 tbsp. In a bowl,mix cornflour,cocoa powder,salt and sugar,so that the mixture is uniform. To this,add ½ a cup of milk and mix well without any lumps and keep aside. Boil water in a pan and double boil the Choco chips in a bowl till completely melted.You can even melt the chocochips in a microwave.Keep this aside. Now heat the remaining milk(1 cup),to this add the cornflour-milk mixture and mix well.Keep on stirring to avoid lumps.Be careful while doing this as the mixture gets thickened very fast .Add vanilla essence to this and mix well. Now add the melted Chocolate choco chips/you can call it chocolate sauce to this mixture.Stir for about 3 – 4 minutes or till thick.Turn off the flame and transfer immediately to the serving bowls.Cover the top of the bowl with a cling wrap.The cling wrap must touch the surface of the pudding.This is done to avoid Pudding skin formation. Refrigerate for atleast 1 hour.Sprinkle some chocolate grains as I have done or some Chocolate shavings and serve and Enjoy! This entry was posted in Uncategorized and tagged chocochip, chocolate, cocoa, dessert dishes, eggless dessrts, eggless pudding, Ieasy pudding.